These sweet yeast rolls feature brioche dough, a classic cinnamon-sugar filling, and delicious vanilla bean frosting! 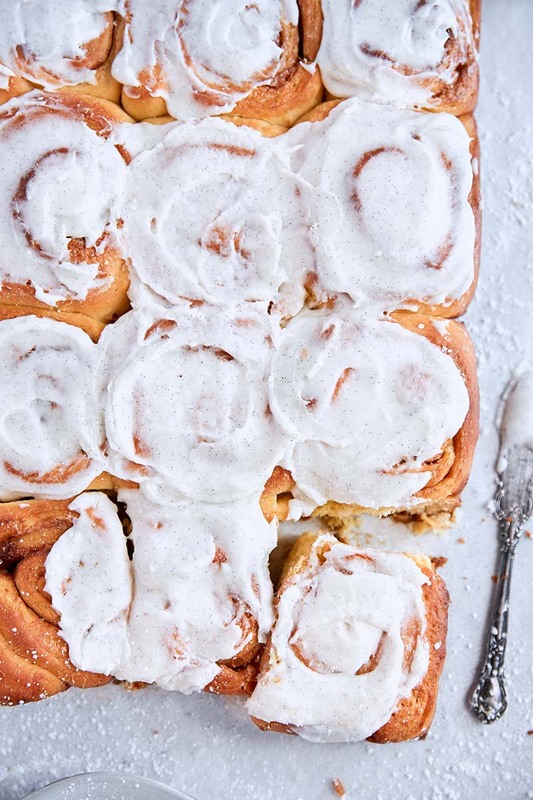 Prep the rolls in advance and bake in the morning to begin the day with freshly baked cinnamon rolls. The whole family will love this recipe for weekend brunch! (2) After 45 minutes, the dough will be puffy and doubled in size. Transfer dough to the refrigerator and chill for 2 hours. (3) Remove chilled dough from the refrigerator. Gently press down dough; cover and let rest for 5 minutes. Spray a 13 x 9-inch baking pan with nonstick spray. a bench scraper to lift dough from the board). in the refrigerator overnight (up to 16 hours). until puffy (about 45 to 60 minutes) before baking. (8) Bake rolls for 28 to 32 minutes, or until golden. Remove from oven and place on a wire rack to cool for 20 minutes. 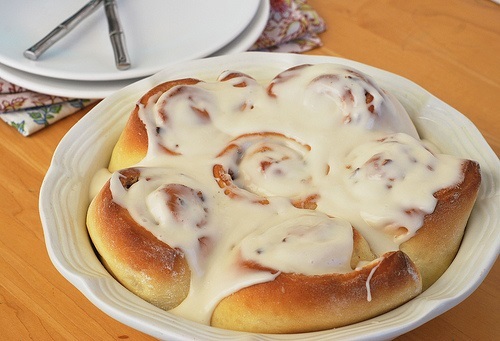 Spread the frosting over the warm rolls before serving. Recipe in partnership with Tutti Dolci. To bake the rolls right away: If you’re planning to bake the rolls right away, work up to Step 5. In Step 5, cover the baking pan loosely with plastic and let rise in a warm place until puffy, about 30 to 40 minutes. Continue with Step 7.